I have always had a love/hate relationship with risotto. It wasn’t a staple in my family’s Italian-American kitchens, but when I discovered it later, it became one of my favorite dishes. I love eating risotto, but I hate cooking it. 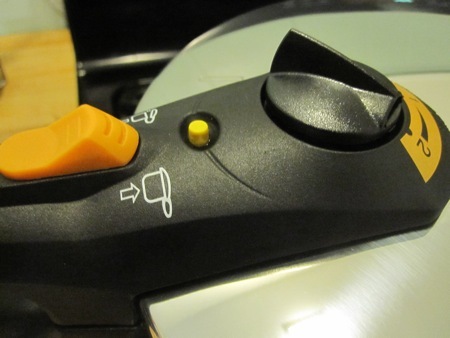 Consequently, I have always been on the lookout for ways to shorten the amount of time needed to tend the rice and stock mixture, and to cut down on how often stock needs to be added and stirred in. Unfortunately for Tre, he wound up creating something that many people think risotto is supposed to be. About 15 years ago, for whatever reason, people tried to mold risotto into a ring stand. This is simply wrong. Risotto should be soupy. If you go to Italy, you’ll be served it that way; ditto, a good Italian restaurant here. Tre’s risotto wasnt even creamy. 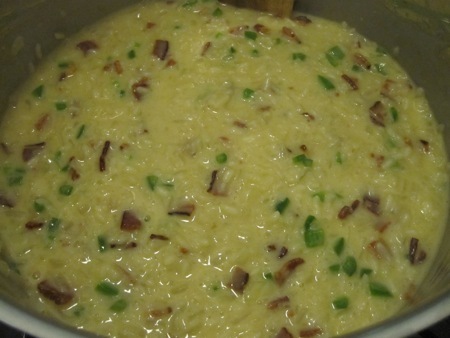 The starch should go into the stock and the risotto should run on a flat plate and not hold its form at all. 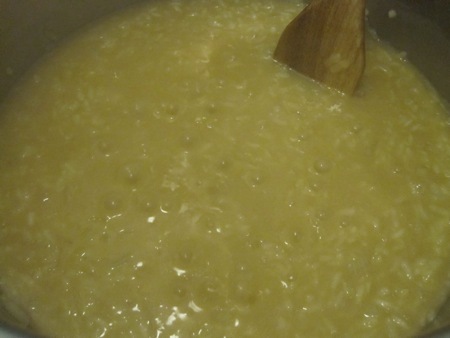 Furthermore, risotto continues to cook and harden further after you stop cooking it, so you need to be even more careful when cooking it to make sure it’s creamy. And, finally, the flavors should be integrated into the dish, not heaped on top of it, as Tre’s were. Tre made a dish he didn’t understand, and we couldn’t give him a pass for the fact that he was taught incorrectly. Both the texture and the flavors were way, way off. Which brings us to Tre. There’s a horrifying scene early in the great Stanley Tucci film, Big Night, where a customer in the dining room of a very fine Italian chef, complains about her seafood risotto. “It’s just… rice!” she gripes, before asking for a side of spaghetti and meatballs. I saw the film in a roomful of chefs and you could hear the collective gasp, the wince of pain, as that theater full of professionals who understood risotto felt – in their bones – the familiar agony of this basic misunderstanding of what should be one of the world’s most sublime dishes. Simply put, risotto is about the rice. Expensive arborio rice, whose subtle textures and flavors need to be nurtured, cherished and respected. 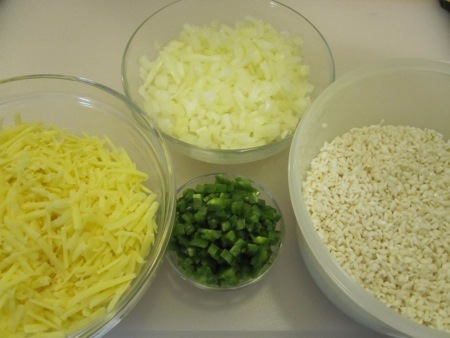 A good bowl of risotto is never overcomplicated with too many ingredients or garnishes. It is never buried in seafood or vegetables or mushrooms or even truffles. It is always – and forever — first — about the rice. One of the most famous seafood risottos, from an island off Venice, has no seafood in it at all – just its extracted essence, delicately, delicately coaxed into broth. Attention must be paid constantly during the cooking process, first toasting the individual grains (in most cases) on the bottom of the pan, then slowly, gradually, feeding in small amounts of broth, stirring constantly to incorporate it. When finished it should be soft – and almost porridgy, but with each distinct grain still possessing a bit of bite. It should lay flat on the plate. Never sit up in a mound. To cook Italian food well, one needs to have eaten good Italian food. And I can only guess that Tre has never eaten a good risotto. There is no shame in this – as most risottos in most American restaurants – even some well regarded ones – are criminally screwed up. One of the most common transgressions is by the “genius” chef who sees risotto as a medium or delivery system for some clever and expensive garnishes – and I suspect Tre has been subjected to more than a few of these both as a diner and during his training. His mentors did him a disservice here. He made a very flavorful vegetable garnish (a lot of it) and buried his risotto with it. He did not cook the risotto correctly – at all. It was thick, gluey, and closer to cement than one of God’s Own Primi Piatti. In a field of offenders, it was quickly agreed by the judges whose screw-up was most egregious. By his admission, he just didn’t know. While an understandable lapse for most, not so for a Top Chef. It was with regret that the judges sent Tre packing. An accomplished and talented professional, I have no doubt at all that the next time I see him, he will be making excellent risotto. has a seven-minute risotto recipe that requires a sous vide pre-cook of the rice, however, a more recent blog post reduced the cooking time to six minutes (not that I was sweating the extra time), but – more importantly – eliminated the sous vide step altogether. A simple two-hour pre-soak in cold water was all the rice needed, with the addition of aromatics for seasoning during the soak. I tested the method with a simple risotto made with chicken stock and minced preserved Meyer lemon, and was very happy with the result. Emboldened by my success, I turned my attention to the Apple and Cheddar Risotto recipe from the book. 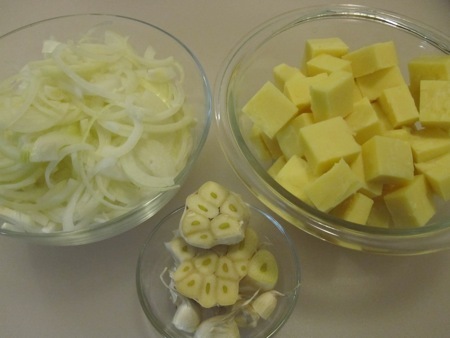 I began with a pound of sharp Cheddar cheese cut into chunks, a halved head of garlic, and two sliced medium onions. 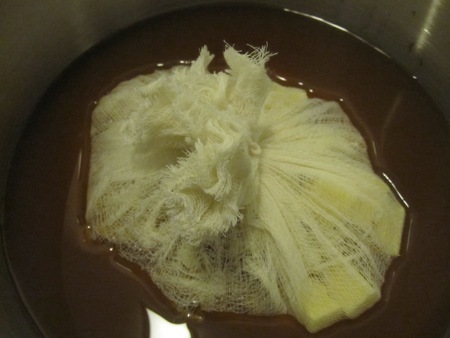 I wrapped them in cheesecloth and added them to nine and three quarters cups of apple cider in a pressure cooker. Yup, the pressure cooker is a new tool, something I’ve never used and had a bit of unease about trying for the first time. Pressure cooker technology has changed since I saw my grandmother’s beast steaming and rattling on her stove; new models have all kinds of failsafes and quieter valves. I cooked the contents at high pressure for five minutes, then let the pressure dissipate on its own. 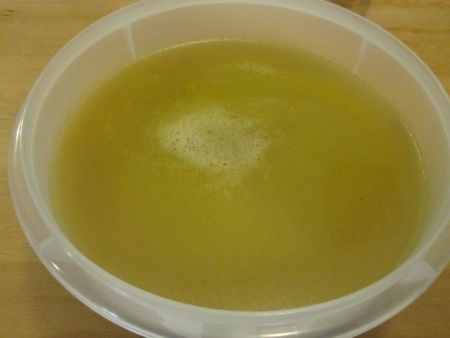 I discarded the bag, then strained and cooled the resulting stock overnight. The next day I skimmed the cheddar fat off the top and reserved it for another use (scrambled eggs, browning french toast). On the day I made the dish, I placed 500 grams of arborio rice in a bowl with enough water to cover and set it in the fridge for two hours. 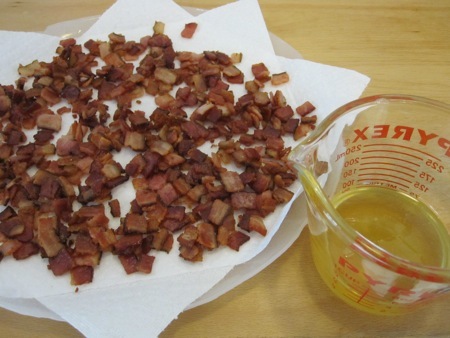 I diced and rendered eighteen ounces of bacon, strained and reserved the fat, and drained the pieces. 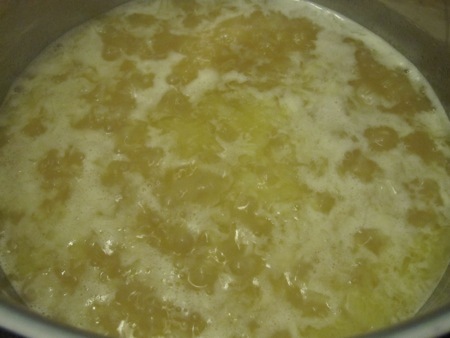 I added seven cups of the apple-Cheddar stock in a pan and brought it to a simmer. While it heated, I drained the rice and patted it dry, diced two medium onions, grated ten ounces of sharp Cheddar, and diced three jalapeños after removing the ribs and seeds. I cooked the onions in the reserved bacon fat over medium heat until they were soft and translucent. 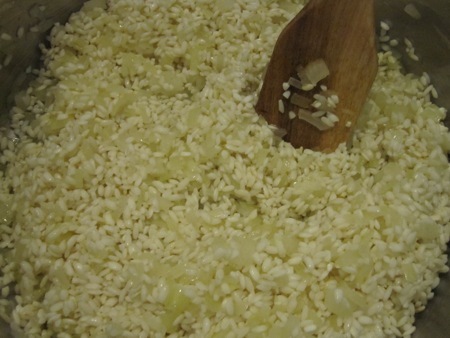 I increased the heat to medium-high, added the rice, and stirred until the grains were evenly coated with fat. Here’s where the leap of faith occurs: I dumped in all of the stock at once and brought it to a boil, stirring to keep the rice from sticking. I lowered the heat but maintained a gentle boil. For the first five of the six minutes, I was sure I had nothing but rice soup, but then the mixture gelatinized. It’s at this stage that I usually made my risotto mistake: it looks too soupy, so I cook it until more of the liquid is absorbed. 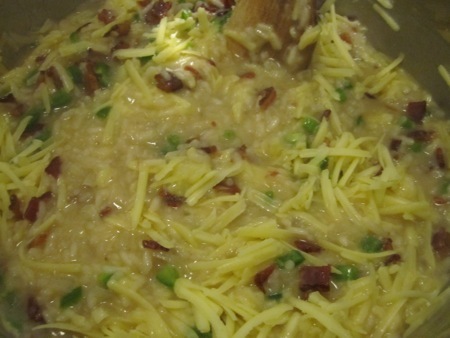 But by the time I add cheese and butter to finish it, the risotto goes stiff. This time I trusted the instructions, and at the six minute mark I added the grated cheese, bacon, and jalapeños. I stirred for one more minute, turned off the heat, and let everything rest for an additional minute. I plated it with the crisp-braised duck legs and was pleased to see the risotto spread across the plate. As for the taste, how could you go wrong with classic combinations like cheese and bacon or cheese and apple? The heat from the jalapeños, along with the tart cider, matched perfectly with the richness of the duck. Very nice, but you’re not accounting for the insane and bizarre time limits in Top Chef. As far as I recall, they had something like two hours in a prep kitchen the day before service, and then some unspecified amount of time (but probably less than an hour) in the actual kitchen right before they served. When would you do the two-hour soak? 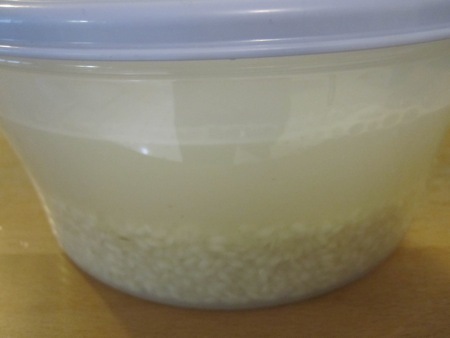 You do the soak they day before, shorten it by five minutes, which gives you enough time to rinse and dry the rice before refrigerating it.